Kodi is one of those innovative products that media addicts adore. With a VPN it’s possible to unlock all sorts of content around the world. Here are the best VPNs for Kodi. In case you weren’t aware of it before reading this, Kodi is an open-source multi-platform software that brings the theatre to your living room. It was first released in June 2004 and hit mainstream audiences in December 2016, facing fierce criticism when questions regarding its legality started to surface—Kodi in its unmodified state is 100% legal; it’s simply a software solution designed to stream content across different devices. Today, Kodi is one of the most popular media players around, something helped by the fact that it’s completely free, open-source, and has a lot of additional functionality and capability thanks to the various add-ons available. One type of add-on you can add to Kodi is a VPN and this is what we are going to be covering today! A VPN—virtual private network—adds an entire extra dimension of functionality and usability to your Kodi box… at least, it does if you pick a good one! When used with Kodi, a VPN encrypts all internet traffic and tunnels it through one of its intermediary servers via the location you’ve connected to. When you do this, you can unblock content that’s geographically restricted—e.g. watch content that’s only available in the U.S. whilst physically located in the UK—and protects you from vulnerabilities that are inherent in third-party Kodi add-ons. Choosing the best VPN for Kodi is very important, though—choose anything other than the best, and you may find it hard to stream any content at all. The best ones have lots of servers located around the world that are fast and always being updated. This means that there will always be a server available that’s fast enough to stream content and can get around geographic filters. You need plenty of international choices. If a VPN only offers one server in each country, it’s likely to be blocked by Netflix. After all, it’s easy to target one server; it’s not so easy when a VPN has hundreds of servers per country, and regularly refreshes their IP addresses and servers. Look for VPNs offering such high server counts and such. Good streaming requires good internet speeds. If a VPN throttles your speeds too much, you can say goodbye to any ideas of streaming content via Kodi. Make sure whichever VPN you opt for, its servers are up to scratch. Consider your protection. Ensure whatever VPN you use offers strong encryption; if you’re accessing less-than-legal materials, you don’t want to be hit with copyright infringement notices and the like. Check out some of our top VPN recommendations below; they all offer extremely strong encryption protections. Got more than one person wanting to use Kodi on your VPN? Or perhaps you simply want to watch multiple things/access multiple files? A good VPN should offer multiple concurrent logins. Does the one you’re looking at not offer the option? Avoid it – there are plenty who do! These requirements are essentially the same when you’re looking for the best VPNs for Netflix since both products face issues around content restrictions. There are many VPNs available for Kodi and we’ve narrowed them all down to 5 we think are the best. ExpressVPN tops virtually every list we do, including our general top VPN list. It’s a great all-around VPN that’s suitable for any and all usage, including on Kodi devices for seamless and effortless streaming. Reliable for unblocking geo-blocked content on services that include BBC iPlayer, Netflix, and HBO, ExpressVPN’s servers are always being updated, with new ones added and older ones that have been geo-blocked removed. We’ve personally never had trouble accessing BBC iPlayer from here in the States—there’s always a server that’s working. ExpressVPN also scores full marks when it comes security, boasting AES 256-bit encryption used alongside the trusted OpenVPN tunneling protocol with other options available. There are native apps for Windows, macOS, iOS, Android, and Linux through a command line. For Kodi devices based on Amazon’s Fire TV, there’s a native app available on Amazon’s own app store. ExpressVPN has plenty of tutorials available, too, for other Kodi devices. To make the job infinitely easier, consider installing ExpressVPN on your router if you are using one that supports VPNs. When you do this, all devices that are connected to your router, including Kodi, will have their traffic tunneled through ExpressVPN on your chosen server. This eliminates the need to set up ExpressVPN natively on each device. 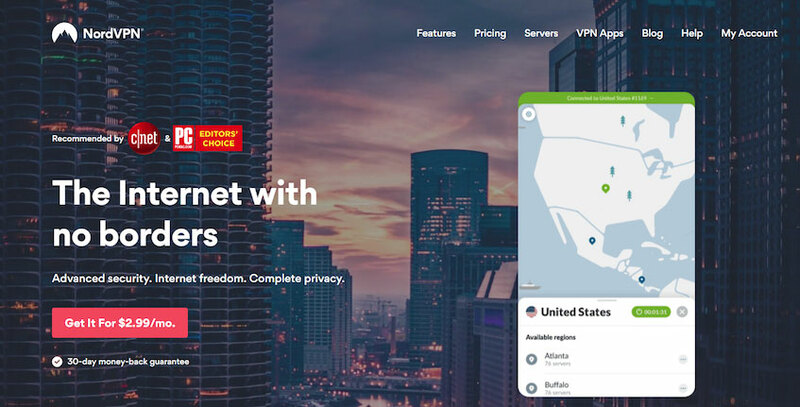 NordVPN is another great all-rounder that regularly features highly on VPN review lists, including our own. At the time of writing, NordVPN offers a massive 5,923 servers operating across 62 countries, 1,926 and 681 of which are in the U.S. and UK respectively meaning that NordVPN is by far one of the best VPNs for Kodi and that you will always find a server that’s suitable for getting around geoblocking. All these servers have respectable speeds making them perfect for streaming. For installation on Kodi, Android users can download an APK file directly from the NordVPN website or use Google Play. At the moment, there’s no Linux version, however, it can be manually configured. Again, just like ExpressVPN, NordVPN supports router installation on models that support OpenVPN which means you can use it with your Kodi device without having to install it natively. In terms of security, NordVPN uses AES 256-bit encryption alongside the OpenVPN tunneling protocol that provides comprehensive and sturdy protection of your IP address, traffic, and identity. NordVPN doesn’t log any information, either. In addition to a native Android app, there are also apps for Windows, macOS, and iOS. When we tested IPVanish ourselves, we found it demonstrated excellent performance levels that are more consistently reliable when compared to others in the same bracket. So far as Kodi is concerned, IPVanish’s native desktop, Android, and iOS apps will work in the background and provide secure, unrestricted access to geo-blocked Kodi content through add-ons. For Kodi users who have it sideloaded or installed on a smart TV, Fire TV Stick, console, or set-top box, installation requires a little more work. If you are using a Fire TV Stick, IPVanish’s app is configured and optimized to be seamlessly used with the Fire TV Stick’s remote control, making it much easier to select from over 1,000 different servers that are fast enough to handle streaming video content, alongside up to 9 other simultaneous connections. IPVanish uses AES 256-bit encryption alongside OpenVPN and doesn’t log anything, meaning your privacy and security is always protected. You can try it now for 7 days risk-free thanks to their 7-day money-back guarantee. There are three different plans to choose from, starting from $10 per month when billed month-to-month, or $6.49 when billed for 12 months at $77.88. While CyberGhost doesn’t natively support Kodi installation through Linux (you’ll have to configure it yourself), there’s an Android app that can be downloaded from the Google Play Store. It cannot be sideloaded or downloaded through an APK, so anybody wanting to use Kodi and has a version of Android without the Google Play Store will need to undertake manual configuration. CyberGhost categorizes all its servers that support bypassing geoblocking by which video streaming services the server works on. So, if you want a server that’s Netflix or BBC iPlayer-friendly, they can be found easily. All servers are completely secure and offer fast speeds that are more than suitable for the handling of even the most intense video streaming. CyberGhost offers a 14-day no questions asked money-back guarantee for its month-to-month plan and a whopping 45-day money-back guarantee for plans that have been pre-purchased for 6 months or more. 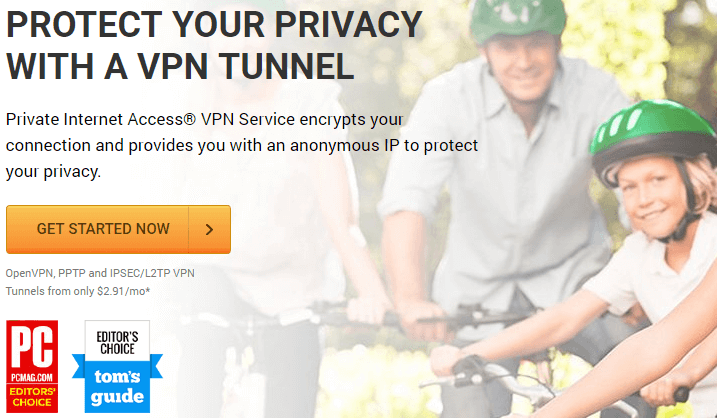 PIA is one of our favorite VPN providers. Although they’re based in the U.S., they have come out victorious in not one, but two court cases where they refused to release data and information it held to the authorities. Even if PIA lost their court cases and was forced to disclose information, it would be of very little use to the authorities because PIA has a strict anti-logging policy that it follows to the letter. For Android and Linux-based Kodi devices, PIA offers a version that works with the OpenELEC Linux distribution (on Raspberry Pi, for example) and an APK file that can be downloaded from the PIA website and installed on Android devices that don’t have a Google Play Store. Both apps are very lightweight and easy to use. There’s plenty of choices when it comes to servers and locations, and they’re all fast enough to handle streaming HD content. In terms of security, there’s both AES 128-bit and 256-bit encryption available, alongside the OpenVPN tunneling protocol. PIA offers a 7-day money-back guarantee and its monthly rolling plan is a budget-friendly $6.95. Subscribe for two years and pay only $69.95, a monthly price of $2.91. When using a VPN with Kodi, it’s not so much about privacy and logging, as it is about fast servers and unblocking content from other countries. You want to be using one that’s available at a budget-friendly price point, has plenty of choices when it comes to servers that are fast and suitable for streaming, and can be used just as easily with Kodi as it does with any other device. We’ve highlighted 5 VPNs that we regard as the very best VPNs for use with Kodi. There are others available, however, many of which you can find we’ve reviewed elsewhere on the website. Be sure to have a browse, and see if you find the perfect one for you!